I'm currently working on an artists' book about a dinner party, so of course I had to have said dinner party to get it started. There isn't really any work to look at yet, but you can see some of my older work if you have a look through some of the posts on my website or the Battenburg Press Tumblr. I invited five friends round and made quite a few dishes, but failed to photograph most of them, so those recipes will have to wait a little longer before being shared on here. I did manage to photograph my new favourite dip though. It's not only delicious and easy to make, I also absolutely love the colour of it. You just can't beat beets for colour, can you?! Try it with fresh flatbread or on a sandwich with some goat's cheese. Perfection! Preaheat your oven to 180C/Gas 4. Place the walnuts in one layer on a baking tray and roast in the oven for 5-7 minutes, until fragrant. Heat a small frying pan over a medium heat. Add the cumin seeds and dry-fry them. You need to keep moving the pan around or stirr the seeds constantly. What you want is for them to release their aroma, but not burn! It should only take a minute or so. Transfer the seeds to a pestle and mortar or a spice grinder and crush them well. Break the bread into chunks and add them to a bowl together with the walnuts. Using a stick blender, process them until you have fine crumbs. You can do this in a food processor also. 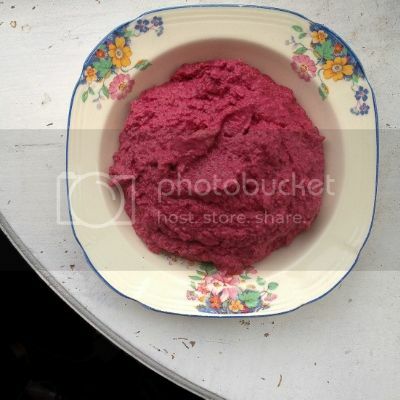 Add the beetroot, tahini, the garlic, a good pinch of the cumin, half the lemon juice, a little salt and a good bit of pepper, then process until you have a thick paste. Taste the mixture and adjust it by adding a little more cumin, garlic, lemon, salt and/or pepper until you like the taste. You can add a splash of oil if you think the dip is to thick. It's nearly the end of June, which in my annual calendar means saying farewell to my final year students and wishing them good luck for life after University. We had a little get together with drinks on Wednesday and I baked a cake. Congratulations to the Class of 2013, BA (Hons) Photography, Manchester School of Art! Some of them are having an exhibition in London in July, following on from their degree show. Have a look at their website and pop in if you're in the area. Oh and the cake was good and well worth making! The recipe can be easily halved and made in a loaf tin or 20cm ring pan. That's what the original recipe was, but I doubled it to use my Gugelhupf pan. Preheat your oven to 180°C/Gas 4/350 F. Grease a gugelhupf pan really well and dust with flour. In a large bowl beat the butter and sugar with an electric beater until pale and creamy. Beat in the eggs and grated lemon rind. using a wooden spoon fold in the self-raising flour, milk and lemon juice until well combined. Spoon half the mixture into the pan. Spoon over the remaining cake batter. Bake for 50 minutes, check after 40 minutes and cover with baking parchment or tin foil if the top of the cake is getting too dark. Insert a wooden skewer to check if the cake is cooked through. The skewer will come out clean if it is ready. If there is still batter clinging to the skewer, return the cake to the oven for 5 more minutes and test again. Set aside for 5-10 minutes before turning out onto a wire rack to cool. I know, I know.....it has been ages! So many things have happened in the last six months. Some good, some less so, some very happy times and also some sad stuff. All of it together meant that I didn't really feel like blogging about what was cooking in my kitchen. But here's to hopefully finding my (blogging) mojo again. Thanks for still reading! This is a recipe that I made a while agao. Easter Sunday to be more precise. I was spending Easter on my own this year and I didn't want to miss out on having lamb for Easter, but it seemed silly to do a whole roast for myself, so instead I just scaled down this wonderful Yotam Ottolenghi recipe from the Jerusalem cookbook. It was delicious and the only issue I had was there wasn't quite enough sauce for basting when adjusted for one serving rather than four. My conclusion is that I'll just make it for four people next time, because than there won't be any sauce issues and it's so good that it should be shared anyways! Preheat the oven to 220C/200C fan/gas mark 7. Place the aubergine halves, skin-side down, in a roasting tin large enough to accommodate them snugly. Brush the flesh with 4 tablespoons of the olive oil and season with 1 teaspoon of salt and plenty of black pepper. Roast for about 20 minutes, until golden brown. Remove from the oven and allow to cool slightly. While the aubergines are cooking, you can start making the stuffing by heating the remaining olive oil in a large frying pan. Mix the cumin, paprika and ground cinnamon and add half of this spice mix to the pan, along with the onion. Cook on a medium-high heat for about 8 minutes, stirring often, before adding the lamb, pine nuts, parsley, tomato purée, 1 teaspoon of the sugar, 1 teaspoon of salt and some black pepper. Continue to cook and stir for another 8 minutes, until the meat is cooked. Place the remaining spice mix in a bowl and add the water, lemon juice, tamarind, remaining sugar, cinnamon sticks and half a teaspoon of salt; mix well. Reduce the oven temperature to 195C/175C fan/gas mark 5 and a half. Pour the spice mix into the bottom of the aubergine roasting tin. 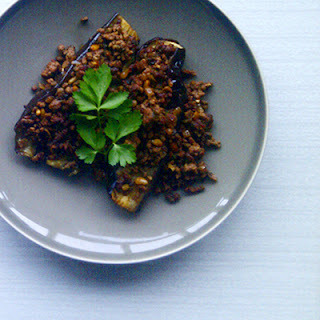 Spoon the lamb mixture on top of each aubergine. Cover the tin tightly with foil, return to the oven and roast for 1 hour 30 minutes, by which point the aubergines should be completely soft and the sauce thick; twice through the cooking, remove the foil and baste the aubergines with the sauce, adding some water if the sauce dries out. Serve warm, not hot, or at room temperature.